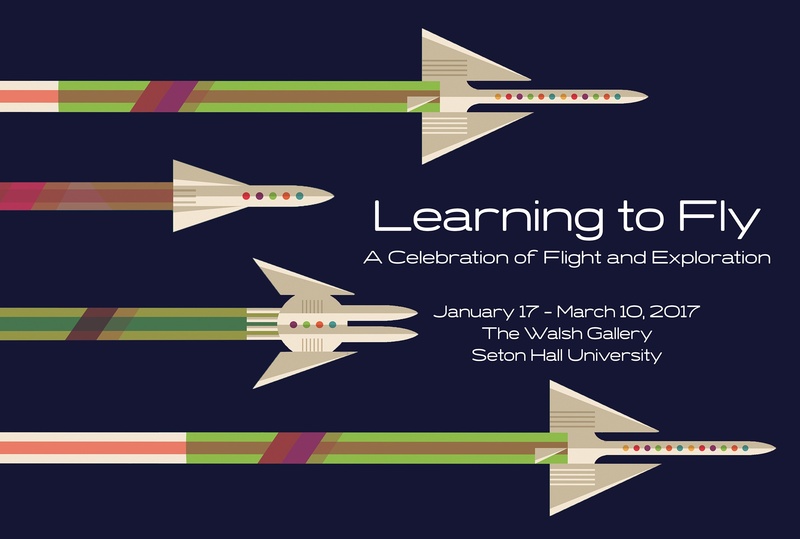 Seton Hall University’s Walsh Gallery presents Learning to Fly: A Celebration of Flight and Exploration. The exhibition commemorates several major anniversaries occurring in 2017, including the 80th anniversary of both Amelia Earhart’s disappearance and the Hindenburg disaster in 1937 as well as the 60th anniversary of the launch of the Sputnik satellite by the Soviet Union in 1957. Using both historical objects and contemporary art, “Learning to Fly” will examine major themes within aviation history including flight as innovation, power, competition, and entertainment while also exploring New Jersey’s impact on aviation history using these landmark events. Artifacts from the New Jersey Aviation Hall of Fame, Cradle of Aviation Museum, Navy Lakehurst Historical Society, Newark Public Library, and the University’s Archives will be featured in the show alongside artwork by Ellie Irons, Dan Phiffer, Greg Leshé, Winifred McNeill, Timothy Pickerell, Chad Stayrook, Lizzy Storm, and Sara Sun. Curators Derek Butler and Kathlene Williams invite visitors to examine the tremendous role that flight has played in society over the last century.